Friends of the Cumbres and Toltec Scenic Railroad,	Richard L. Dorman Collection. The above image is current artist rendering intended to show the detail level that will be offered on the model, these are subject to change without notice due to the on-going production process. 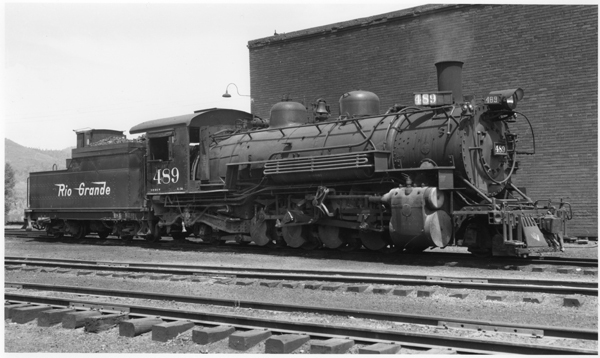 The K-36 Class Locomotives constitute the largest steam engines purchased new for use on the Rio Grande narrow gauge, and saw extensive use throughout the railroad system. These engines quickly became the workhorses for freight operations on the Rio Grande when they were received from Baldwin Locomotive Works in August 1925. This release will include four K-36 Mikados that survive to this day -- Nos. 481 and 486, which are in service on the Durango & Silverton Narrow Gauge Railroad, and Nos. 483 and 489 at the Cumbres & Toltec Scenic Railroad. Also part of this release will be No. 485, which was scrapped after meeting its demise in the Salida turntable pit in the early 1950s. These ready-to-run models will be equipped with a road pilot, doghouse, precision can motor, maintenance-free lighting, and a DC/DCC SoundTraxx® Digital Sound Decoder.